You give so much to your cats, it’s time they gave back — in the form of vaguely expressionist digital paintings. Pick a color palette, with choices ranging from muted grays to garish neon, and set your tablet down in front of your cat. A rainbow-colored mouse emerges from the edge of the screen and scrambles around, tail twitching so enticingly I kinda wanted to bat at it myself. Wherever the cat attacks the screen, a smear of paint appears, leading to anything from a wild map of attempted mouse-murder to a minimalist canvas, depending on your cat’s demeanor. This is a winning app, not just because it gives overly attached cat owners a record of their precious pet’s playtime, but because the creators really know what gets a cat going. Not every cat I showed this to leapt on the digital mouse, but almost all of them did, and some went after it with a ferocity usually reserved for my feet at six in the morning. WIRED Amusing squeal when your cat catches the mouse. TIRED Squeal not so amusing after the fiftieth time. What could be better than a game for your cat? A game you and your cat play together! I say “could” because, in the case of the awkwardly-titled Enjoy With Cat, the experience is a bit lacking. The app offers five different virtual toy options — a hamster, a flying saucer, a pair of butterflies, a goldfish or … an octopus impaled on a stick? A ratty broomstick with squinty eyes? It’s tough to tell, but it’s kinda creepy-looking. Each option works the same: There’s a small square in the corner you can use to direct the enticingly vulnerable toy around the screen. Some levels have a hidey-spot you can use to further tease your beloved pet, and when “caught,” the virtual victim makes an annoying noise and disappears, and the next round begins. WIRED Auto-play mode for when you don’t feel like entertaining a mammal with a brain the size of a plum. TIRED Delay between your finger and the toy, adding to the challenge of getting your pet’s attention. While it’s not billed as a cat toy, Pocket Pond serves about the same purpose to cats as it does to human beings, providing something vaguely interesting to look at, and perhaps interact with once in a while. The app is straightforward: It displays a nicely-rendered koi pond from above, complete with plant life and shimmering water patterns. Multicolored, realistic-looking fish swim around aimlessly, and you can tap the screen to make a small splash and send the fish heading away from your unharmonious interference. If you absolutely must control the environment — which seems counter to the spirit of the app — you can add or subtract fish, lily pads or a dragonfly. 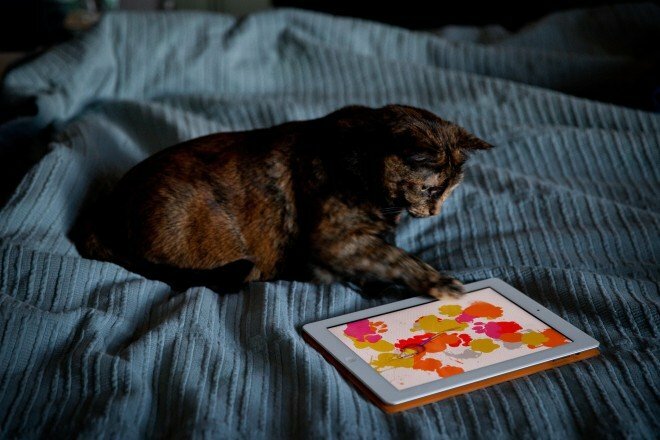 How much does this app appeal to cats? Well, as with all things, it depends on the cat, as well as the cat’s mood. In many cases, though, the cat’s initial curiosity will settle into a sort of casual fascination, and you and your cat can enjoy a few minutes of meditative peace with your animal companion. WIRED You can feed the fish with virtual fish food. Don’t know what that does for cats, but it’s kind of neat. TIRED Interface for deleting fish and lily pads is awkward. Previous articleCan Yahoo ever be cool again?